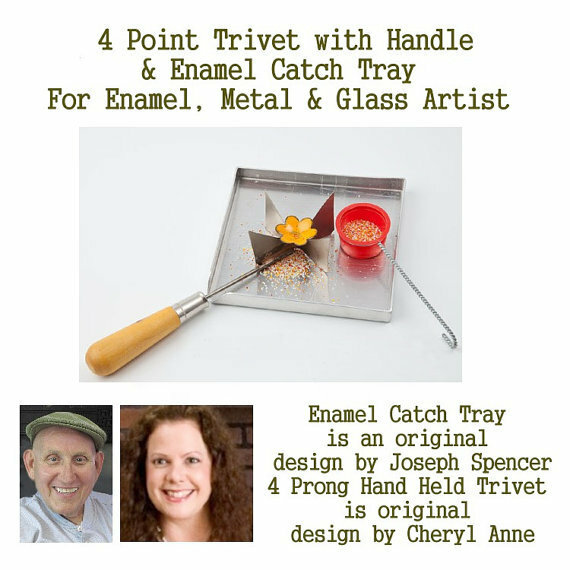 4 Point Trivet and Catch Tray with sifter for enamel, metal and glass artist. 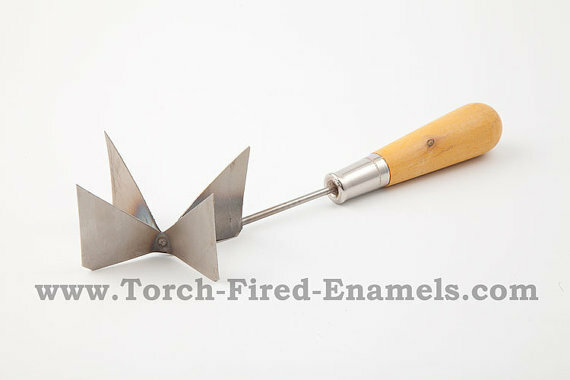 This is an original tool design by Joseph Spencer, a pioneer of torch fired enamels. 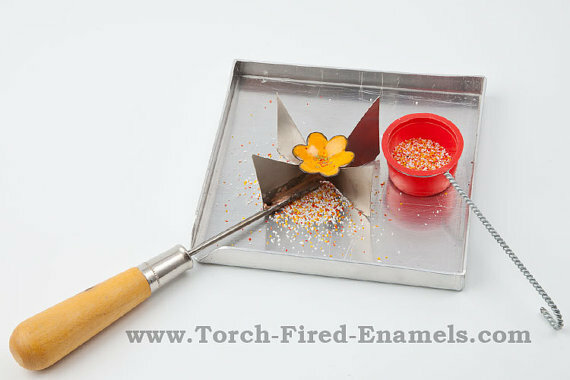 Torch Fired Hand held trivet and enamel catch tray with enamel sifter kit (4 Prong) Item # TK4 $ 40.00 Torch Fired Hand held trivet and enamel catch tray for single torch and multi torch firing of enamels with 4 prong trivet The over all length for the torch fired hand held trivet is 7 1/2 to 8 inches long including the wooden handle which is 3 inches long. The trivet which is used to hold the metal pieces in place, while firing, measures 2 inches wide and is 1 1/2 inches tall which is considered to be the medium size, and used most often. This hand held trivet can be used over your torch, and can with stand temperatures of 2800 degrees. The hand held trivet is a must for torch fire artist and can be used with propane gas, MAPP gas or natural gas with oxygen, or air. The catch pan is heavy aluminum which measures 5 inches by 5 inches square and is 1/2 inch deep. There is a opening that is 1/2 inch wide which allows you to pour out any excess enamels you may have after applying your enamels to your piece. This will save you money, time and frustration while you recycle your unused enamels. The lightweight plastic sifters has a 40 mesh screen which is used for working with 80 mesh enamel.